SCP-3072 in containment at Foundation Administrative Complex-55. Special Containment Procedures: SCP-3072 is to be stored in a category-SSPT1 researcher-accessible office in Foundation Administrative Complex-55. 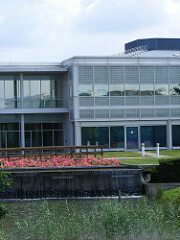 The office is to be furnished with a desk, chair, photocopier, connected Foundation database terminal, and a lockbox. The office is to be limited to Level 4+3072 persons, any Level 5 persons, or any persons carrying temporary Level 6-Delegate status. Keep SCP-3072, its containment area, and the Foundation database terminal inside its containment area in proper working order with standard tools and materials, to be made available onsite. Photocopy and transcribe all SCP-3072 messages and place them in a secure location on the Foundation intranet, in a directory only readable by Level 6 personnel. Archive the printed SCP-3072 messages in the on-site lockbox provided for this purpose. SCP-3072 is to be accessible to all Foundation personnel in the event the organization-wide Emergency Threat Level is set to 9 or 10, and will remain accessible for the duration of the emergency. Available personnel in or nearby Foundation Administrative Complex-55 should attempt to reach the office in which it is contained during such an emergency, following instructions detailed in the Extraordinary Special Containment Procedures, located at ESCP-3072. 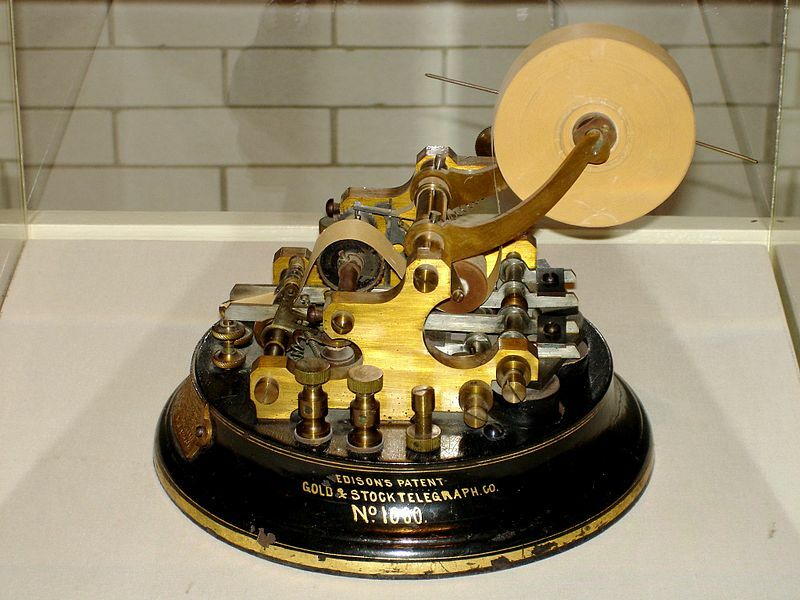 Description: SCP-3072 is an Edison Gold & Stock Telegraph Co. ticker tape machine. When properly powered and stocked with tape, it will print newly generated alphanumeric messages of varying content, even if disconnected from a telegram wire and blocked off from electromagnetic signals of any kind. The Foundation has not yet discovered a method to influence which messages SCP-3072 produces. 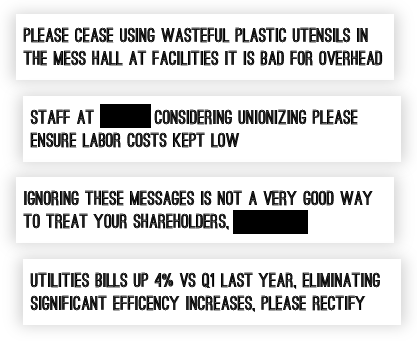 SCP-3072's messages seemingly originate from an irate business shareholder and are invariably advice or direct orders on what the operators of their invested business should do to increase the value of shareholder investment. SCP-3072, if provided enough ticker tape, outputs an average of 441 printed messages in a day, though the frequency of messages is highest on weekdays, between 9 AM and 5 PM in the local time of wherever SCP-3072 is currently located. Testing of SCP-3072 outside the jurisdictions of current legal time zones has not been initiated due to ███ █████ ██████ ██ ████████ ██████ ██████████. Non-redacted examples of SCP-3072 messages and a more detailed description are available to qualified personnel. In the event of the emergency level specified in the Special Containment Procedures, all personnel may access this information in the Extraordinary Special Containment Procedures at ESCP-3072.